Mensusa https://www.mensusa.com/articles/men-dress-white-shoes-are-appropriate-for-all-theme-parties.html Men Dress White Shoes Are Appropriate For All Theme Parties A man looks complete only when he takes care of each and every ensemble of his attire. The shoes play a great role in portraying your style. Often colorful shoes are worn for theme parties. 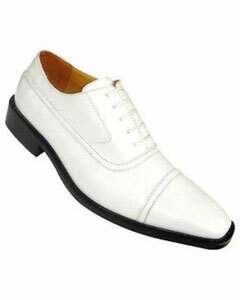 Whether you wear a pair of men dress white shoes or orange dress shoes, you will look outstanding. Like dress pants and dress shirts, dress shoes is an important accessory that makes you look smarter and more stylish. However, choosing the appropriate color that matches the color of your suit or tuxedo is very important. Hence, a style-conscious man always keeps a pair of men dress white shoes in his collection so that he is never at a loss while matching his shoes for a theme party. At MensUSA you will find an amazing variety of attractive men dress white shoes that are styled to keep parity with the attire you wear. White is not only a sober shade but is versatile too. Irrespective of the cuts and features of your apparels and their colors, white dress shoes are very handy especially on special occasions like theme parties. Take care of the fit and comfort factors of your footwear or else the entire show will be spoilt. A comfortable pair of designer men dress white shoes can simply change your looks and make you stand out of the crowd because you feel confident about your appearance and at the same time carry yourself with dignity as the dress shoes perfectly match with the theme of the party. The exotic pair of dress shoes like red alligator shoes is at the top of list of theme party dress shoes. As it is, alligator shoes have a distinct status in the footwear world mainly because of its exclusive looks, special features and uniqueness. Exotic leather is not only expensive but is exclusively designed and manufactured to maintain the original looks of alligator skin. These shoes are available in a variety of shades and the manufacturers try to maintain the scaly looks of the alligator skin. However, when it comes to theme parties, you need to choose the perfect attire to establish your dignity and sense of style. In such situations, the red alligator shoes rock the show. Red is a gorgeous color that portrays boldness and strength. And so when a pair of red alligator shoes is worn by a man of great features at the theme party, everyone looks at him with awe and admiring looks. Visit MensUSA to pick out the most comfortable pair of red alligator shoes to show off your style signature. Unlike yester years, men do not stick to the old style and typically conservation shoes of black and brown. Nowadays, the color of the apparel are often given especially for theme parties. This makes it compulsory for all those who wish to attend the party to wear clothes according to the theme. When gorgeous shades like red, orange or yellow is the color of the theme, you need to get ready likewise. Orange dress shoes make one look bright and gay. A party is a place to enjoy and dance away the night. On such a special day, a pair of orange dress shoes with matching dress orange suit, will surely turn the heads of all at the gathering. The especially constructed orange dress shoes are skillfully created by experts of the leather world.